Last week, we had our routine quarterly appointment with the exterminator. Our house is surrounded by trees, and sadly, crickets love our basement. Therefore, I look forward to these appointments 4 times a year! Wish our exterminator resembled Uncle Jesse circa Full House Season 2. Mullet and all. The hard part is that the Princess cannot be around for FOUR long hours after he sprays for bugs. Keeping her out of the house through feeding and naptimes is pure torture. Torture. Especially if she doesn't nap. So when the King offered to take her to work for the morning, I was all about it! But alas, the King taking the Princess away meant a few blessed hours to myself. At home. For the first time since the Princess has been born. I got to shower without a baby or a monitor. I got to eat breakfast, sip my coffee slowly and bask in the glory of a quiet house! It was wonderful. As much as I love being the Princess' favorite person alive and playing making a fool of myself everyday, extended naptimes rule. Clearly, she had a rough morning at the office. When is take your children to work day again? Soon? Because the King had so kindly taken on the added responsibility of bringing itty bitty to the office with him for the morning, I thought I sort of owed him. 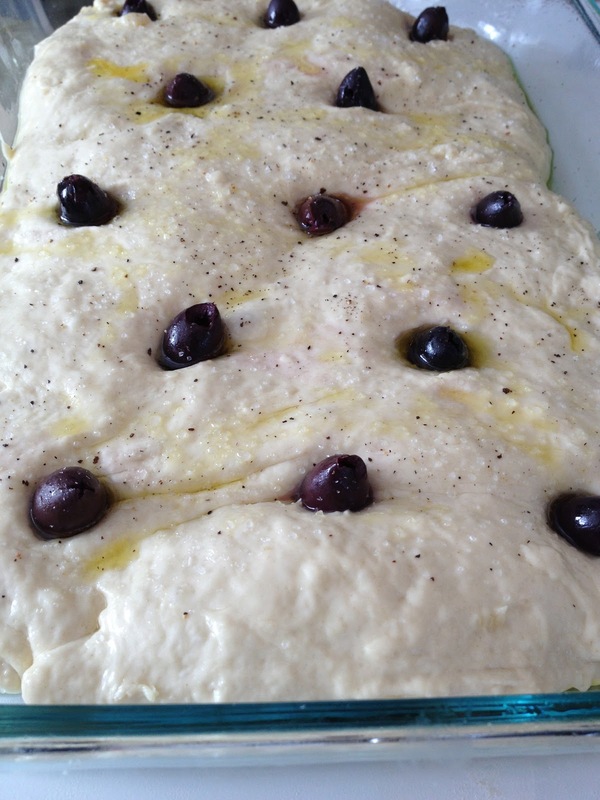 So I made him some delicious focaccia with roasted garlic and kalamata olives. Thankfully, kalamata olives taste like pickles. It's all other olives that utterly horrify me. Speaking of things I hate (olives, mayonnaise, and Michael Buble), I truly hate how many times you have to let focaccia rise. Thankfully, my mixer did all the dough work and the rising thing wasn't too horrible. Just twice. The fact that I served it with salad also made it okay for me to bake cookies after dinner. Logical, right? More to come on the cookie portion of the meal! Does the cute sleeping baby in the middle do anything to help out the olives?? I swear kalamata taste like pickles! Wow. I need Dave to take Harrison to work one day because that sounds GLORIOUS. Glad you got some alone time! I agree that extended naps are the best. Too bad Harrison only takes a 2+ hour nap maybe once every 3 weeks. 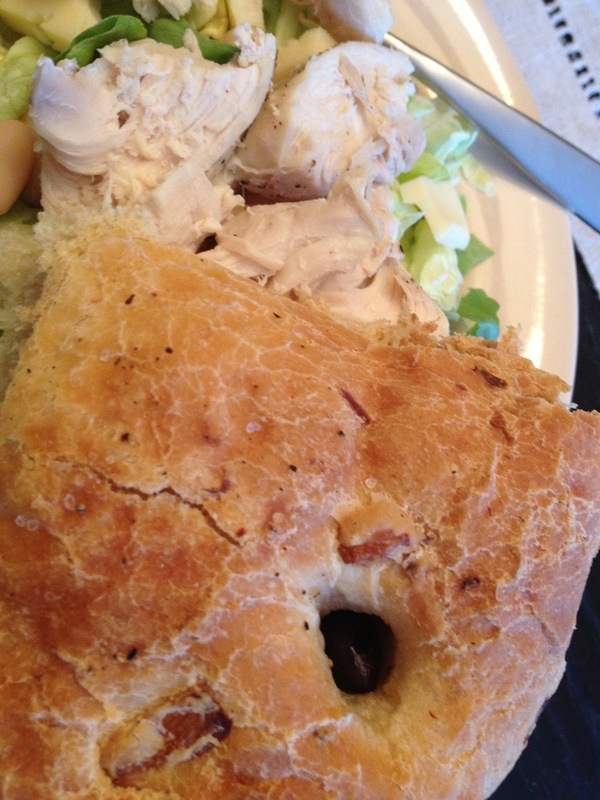 Unlike my sister, I love olives, and that focaccia looks amazing. I really need a bread maker. OMG!!! You ate olives!!! I am so proud! "And in this crazy life, and through these crazy times...."
Pretzels + Chicken = Yum.